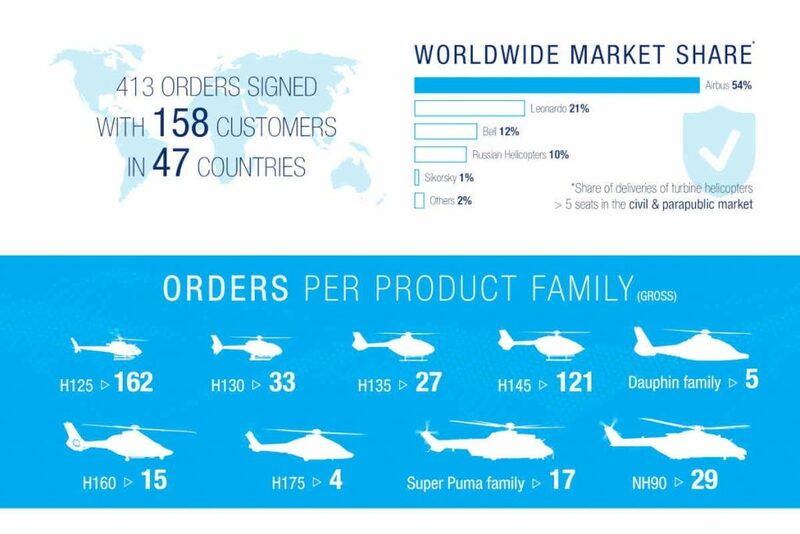 Airbus Helicopters delivered 356 rotorcraft and logged gross orders for 413 helicopters (net: 381) in 2018, which is up from up from 350 gross orders in 2017. The company states these numbers maintain its lead in the civil and parapublic market, while reinforcing its position in the military market based on key international campaigns. The company also booked 148 orders for light twin-engine helicopters of the H135/H145 family and secured 15 orders for its next-generation H160. At the end of last year, the overall backlog for Airbus Helicopters increased to 717 helicopters. In 2018, Airbus Helicopters delivered the first of 100 H135s for China in Qingdao, where the company expects a dedicated final assembly line to serve the growing demand of the Chinese market for civil and parapublic helicopters. As well, the Hong Kong Government Flying Service took delivery of the first H175s in public services configuration. Airbus Helicopters also points to a successful 2018 for the Super Puma family, which was selected in key military campaigns and also attracted new civil and parapublic customers with repurposed H225s previously operated on the oil and gas market. 2018 proved to be a positive year for the NH90, explains Airbus, which attracted orders for 28 units in Qatar while being selected by Spain in the framework of a follow-on order for 23 units. Key program milestones in 2018, according to Airbus, include the power-on and ground testing of the CityAirbus electric vertical take-off and landing (eVTOL) technology demonstrator, ahead of its maiden flight expected in early 2019. As well, the first H160 in serial configuration entered flight trials in 2018, while the VSR700 unmanned aerial system demonstrator performed its first unmanned flights at the end of the year.